President Barack Obama may have gotten big laughs Saturday at the 89th annual White House Correspondents’ Dinner, but first lady Michelle Obama stole the show in a shimmering silver gown and ringlets of curls. Obama dished out one-liners about everything from 2016 Democratic presidential candidate and former Secretary of State Hillary Clinton’s recent media woes to his bromance with Joe Biden to climate deniers. “For many Americans, this is still a time of deep uncertainty. I have one friend, just weeks ago, she was making millions of dollars a year, and she's now living out of a van in Iowa,” he joked about Clinton’s campaign tour bus, fondly called the “Scooby Van” by the press. And to maintain his, um, diplomacy, while addressing climate deniers, he brought along his “anger translator,” Luther, played by Keegan-Michael Key of comedic duo Key & Peele, who expressed his rage in a hilarious bit. The first lady brought what People magazine described as a “retro flavor” to the event, which in 2009 became known as the Nerd Prom because the crowd consists of, well, a bunch of politicians and journalists. Known for her singular style, the first lady did not disappoint, donning a glittery silver Zac Posen gown, doorknocker earrings and ringlets. 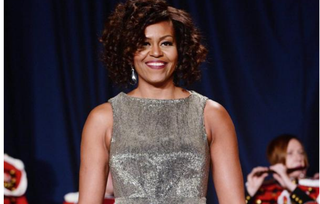 Michelle Obama was a showstopper in her sartorial splendor.